The best feature of this elliptical is its price. A Magnetic elliptical at this price is a win! It has adjustable resistance, data screen, heart rate monitor, pedals, and many more. The two handlebars and two pedals allow for a full body workout. The pedals are equipped with a non-slip grip that keeps you from slipping while using the machine. The handlebars are padded with thick foam to increase the comfort level. The LCD screen provides all the information you need, like the number of calories burned and how far you’ve gone. With a smooth magnetic resistance, the machine runs naturally and without a hitch. If you’re looking for a great in-home machine that will get your heart rate up, this is the perfect machine for you. Priced under $170, the Sunny Magnetic Elliptical Trainer won’t burn a hole in your wallet. In fact, it will probably save you the money you would’ve spent on a gym membership. This machine is especially helpful for people who can’t find the time to go to the gym. Its relatively light weight allows it to be moved from room to room, and its sturdy yet compact frame lets it fit anywhere in the house. Instead of taking up an entire room, it can fit snugly into a corner and not distract from everything else. The frame is relatively sturdy, proving to be a well-built machine. Customers have previously expressed their delight over the machine, saying it, “moves around the house easily, for there are small wheels on the front” and “it can do just as much as the thousand dollar ones and you don’t need a gym membership!”. Others have been thoroughly impressed by the machine and have complimented its endurance. Aside from some minor squeaking, the machine is virtually noiseless and proves to be a solid investment for those living in apartments or houses where sound carries. While some customers have praised it, others have brought it down, saying that it squeaks a little too much. This can be fixed by tightening the appropriate nuts and bolts, and by also applying a little lubrication to certain areas of the machine. Overall, the Sunny Magnetic Elliptical Trainer is certainly a machine worth having. For the price, it’s definitely worth giving a shot. 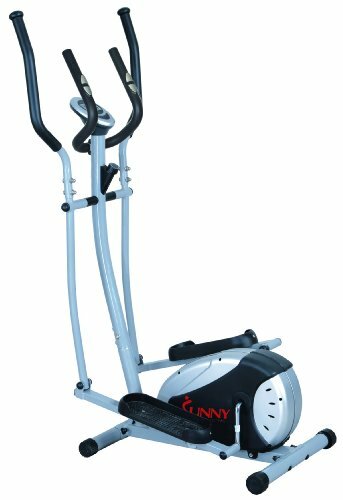 Elliptical Trainer with Hand Pulse Monitoring System by Sunny Health & Fitness - SF-E905, Sunny Distributor Inc.
Want a good workout in the comfort of your own home? Don’t want to spend hundreds, even thousands, of dollars on an elliptical trainer? The Sunny Magnetic Elliptical Trainer is the machine for you. Priced under $179, this trainer is one of the hottest machines on the market. Can I put my nexus 9 tablet on the display and hang on the stationary handle? You can. But I would advice strongly against it! I really hate this elliptical. Its constructed poorly, its light weight and very uncomfortable. I really wish I hadn’t bought this one. I completely agree with Eric. I am very happy with this elliptical. I am 5’1″ and 115 lbs. I have no issue with the stride or its light weight. for me the light weight is a feature itself (I can easily move it any where I want).